….I started with page 1 as the source because it is worth looking at all of the pages of this web site. I think these pictures actually came from page 4…. (1.) THE SIZE OF THE BIRD: How does the bird’s size compare to surrounding objects? How does it compare to more familiar songbirds? How long is the tail? Does the head appear large or small in proportion to the body? (2.) THE PLUMAGE OF THE BIRD: What is the bird’s overall color above and below? Are there any streaks, stripes or colored patches on the face? Is there a cap or hood? Is there streaking, striping, barring, or spotting on the chin, chest, flanks or abdomen? Is the tail striped or barred? How thick are any markings? Are there any bare skin patches, and if so, what color are they? (3.) ACTIONS OF THE BIRD: Is the bird looking around for food while perched? Is it preening(cleaning itself), sunning or eating? Does it stay perched for long periods or just short breaks? (4.) LEGS AND FEET: What color are the legs and feet? How large are the talons? How thick are the legs? Are the legs bare or are they covered with longer feathers? (5.) WING SHAPE: How long and wide is the wing compared to the bird’s body? Are the wings blunt or tapered? Are the primary (fingertip) feathers splayed or held closed? Where is the wrist joint in comparison to the bird’s head? Is there a bulge along the trailing edge of the wing? (6.) WING PATTERN: What colors are visible on the underside of the wings? Is the leading edge light or dark? Is there a definite pattern to the wings’ undersides? Are there markings near the wrist or edges of the wings? Are any colors solid or barred? Do the secondary flight feathers contrast with the primaries? (7.) FLAPPING: Is the bird soaring or gliding? How frequent are flaps, and how fast? Is the bird hovering or using a stoop dive while hunting? Are the wings held level with the body or slightly above or below when gliding? (8.) 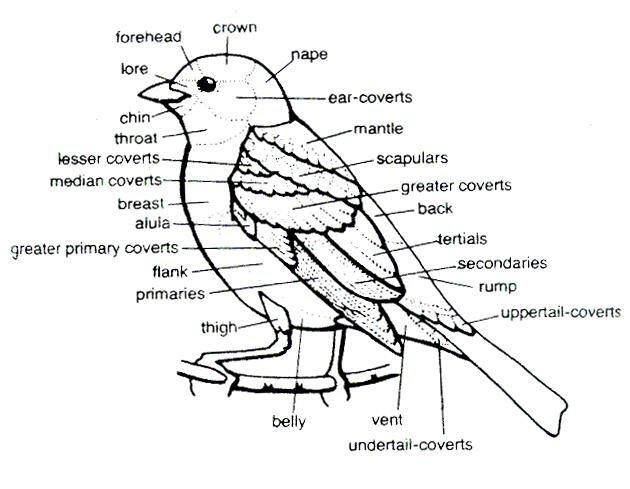 BODY PATTERN OF THE BIRD: Are there visible color contrasts between the body and wings? Is there a belly band of streaks or dots, or a color wash on the chest? Do the legs form a contrasting color to the body? (9.) PAY ATTENTION TO HOW THE TAIL LOOKS: How long is the tail? Is it held fanned out or tight together? It is blunt, rounded or pointed? Is it barred or does it have a different colored tip? (10.) 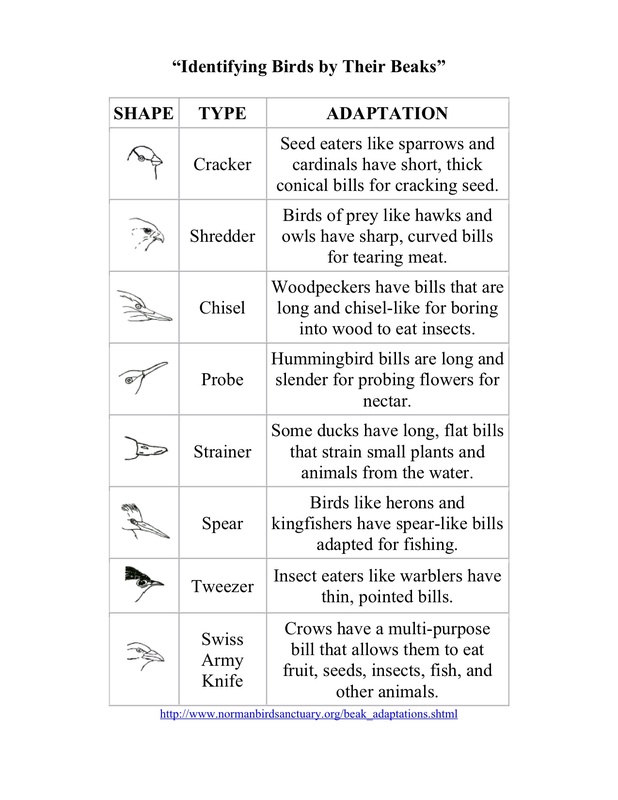 WHAT SHAPE IS THE BEAK ON THE BIRD: As shown in the diagram above, birds have different beak shapes depending on the types of food they eat. (12.) WHAT PREY DOES THE BIRD PREFER: I do not like this topic much but, that is nature and everything has to eat. Birders who are patient enough or who, unlike me, care to watch and see what the bird is eating or hunting can use that as a clue to which bird they are watching. Seeing a bird with prey is a way to help judge size, and knowing what they eat, from worms, insects, fish to carrion, can help make identification easier. If you want to attract birds to your yard or garden, there are 4 essential things needed to do so and this is true for any Natural Habitat and any creature….even us. Grow in full sun to light shade for blooms in summer through autumn. Many gardeners know this plant as gayfeather. Don’t be surprised when you see an American goldfinch gripping the purple spikes of this flower head. It grows up to 5 feet in full to partial sun and blooms in summer. Zones vary by variety….I have recently found out that there are many varieties native to Indiana to choose from. Plant in full sun. It is a drought-tolerant superstar that blooms in late spring through late summer. They bloom in late summer and into fall. Deadhead the flowers to promote continued blooming, which in turn offers an ongoing food source for birds. Blooms in midsummer to early fall. You can’t expect to grow your own seed without this classic bird magnet. If you are like me, you love having hummingbirds to watch. They are extremely attracted to the color red. That is one reason I love them….that is my favorite color too. Anyway, here is an organic recipe for nectar water (sugar water) for hummingbird feeders. Catbirds and Orioles will show up at times to feed from them as well. I usually make 1 cup of water with 1/4 cup of granulated sugar each time. For me, that fills up two normal size hummingbird feeders. Only use granulated sugar and do not use dye to make the water red. Believe me, if your feeder is red, they will find it. 2. Add the sugar and stir until the sugar is dissolved. 4. Fill your feeder and store any remaining nectar in the refrigerator. You can keep your hummingbird nectar in the refrigerator for up to 2 weeks. Catbirds, Orioles, and many butterflies also like grape jelly in a dish, over ripe fruit and for Orioles….oranges.